Congratulations to Hobo John of Costa Mesa for winning Bike of the Month with his 1931 Indian Scout 101. John won a $20.00 Beach Burgers gift certificate provided by Beach Burgers and The Scooter Solution. John has been involved with this meet longer than I have. He's been a member of The Antique Motorcycle Club of America for over 20 years. He has owned this bike for about 3 years. The Scout 101 was made for four years from 1928 through 1931. It has a two inch longer wheelbase than the standard Scout and sits two inches lower. 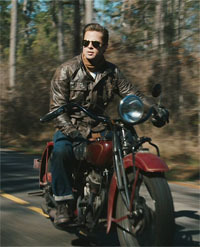 This motorcyle starred with Brad Pitt in the 2008 movie The Curious Case of Benjamin Button. This was before John owned the bike. Hobo got his nickname back in the 1970's when he bought a slightly used 1972 Harley Davidson Super Glide and rode it back and forth across the country several time. He still rides that Super Glide, and it's been to our meet several times. Thanks John for bringing this awesome bike to our meet. View all the photos in our April Gallery.